Writing In A Different Genre? Since I’ve been occasionally flirting with the idea of writing a space opera fiction and/or comic series for at least the past few years (about the closest I’ve got to one so far is a sci-fi/comedy webcomic I made in 2010 called “Yametry Run“), I thought that I’d write an article on the subject of how to write something in a genre or a sub-genre which you’ve never written in before. 1) Know your genre: In short, if you’re thinking of writing something in a genre you’ve never tried before, be sure to read and watch as many things as you can from the genre you’re looking at. If you’re short on time, then focus on the most famous things from the genre. If you’re short on money, look for free things like webcomics, free e-books, online articles about the genre, and trailers or look for inexpensive things like second-hand books and/or DVDs. But, whatever you do, be sure that you at least have a fairly good outline of the genre before your start writing in it. The main reason for this is that it will help you to avoid common cliches (every genre has them) and it may also give you a sense of what you do and don’t like about the genre in question (eg: if you’re planning to write a detective story, then you might find that you prefer “police procedural”-style detective stories to more traditional detective stories). Plus, it will also give you a sense of what works well within the genre – but this is no excuse for plagiarism. Taking useful basic features and concepts from a genre (eg: a crew of misfits and outlaws on a spaceship, faster-then-light travel etc…) and making them your own is perfectly acceptable and a natural part of creativity. However, directly or mostly copying other people’s stories is nothing but plagiarism (eg: if you decided to call that spaceship full of misfits and outlaws “Serenity” or “Moya”, then this would be blatant plaigarism. Likewise, if all your characters are clearly based on characters from another work, then this can come dangerously close to plagiarism, depending on how it is done). 2) Love your genre: If you’re going to be working in a new genre, make sure that it is one that you love and are genuinely interested in. Whilst it can be a fun creative experiment to write in a genre which you’re indifferent about, if you’re serious about trying a new genre, then you need to be passionate about it. You need to be able to look at your new genre and honestly say “I love this genre so much that I want to add something great to it!”. I’ve written before about geeking out about your stories and this is especially important if you’re working in a genre you haven’t written in before. You’ll be effectively going into what is, for you, uncharted territory. You’ll be trying something different and new and this will probably require slightly more thought and effort than writing in your “usual” genre. As such, you will need enthusiasm, determination and passion – the best way to get this is to write in a different genre that you genuinely love. 3) Test it out: Before you commit yourself to a long novel or a comics series, experiment a bit with shorter works. Try writing a short story or a flash fiction story in your new genre. Try writing a possible scene from your next novel. Try drawing an “extract” from the comic you’re planning. Whatever you do, just start small. Testing out your new genre is probably the best way to see whether writing in it is a good idea or not. If your test works really well, then go for it! If your test doesn’t go that well, then you’ve just saved yourself a lot of time and effort and you’ve also learnt that it is a good idea to either change something about your idea or wait until you’ve gained more writing experience. 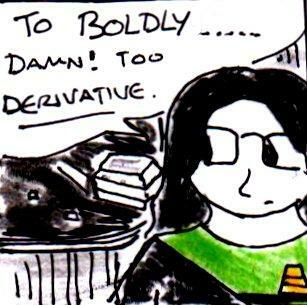 One example of this from my own creative work was when I thought about making a sci-fi webcomic back in June. 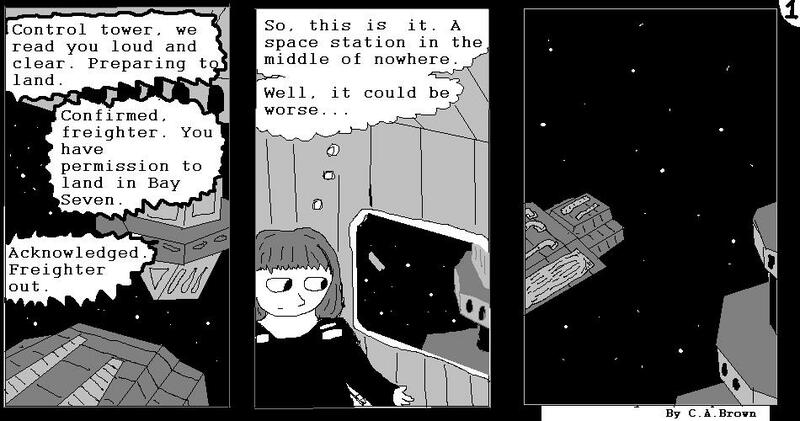 My original plan was to make a “serious” narrative space opera comic which would be drawn on the computer in greyscale. However, after making one test comic (which I’ll include in this article) I soon realised that the idea wouldn’t really work (it looked like a bad “Star Trek” pastiche for starters…), so I returned to the project I was currently working on instead. 4) Mix your genres: I’ve written about this in much more detail in another article but one way to do something original in a different genre is to mix it with another genre (eg: sci-fi/horror fiction, historical detective fiction etc…). Plus, if you’re unsure about writing entirely in a new genre, then adding elements of genres you’ve had more experience with can help you a lot too. This entry was posted in Writing and tagged creativity, genre, writing.